Curtain rods are important for better look of the room. 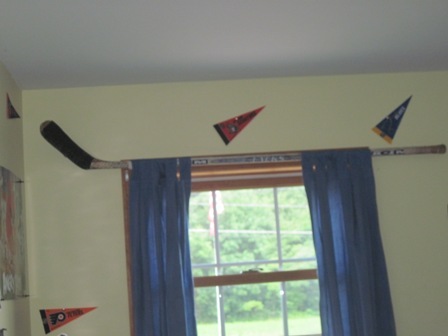 However, if you want to set a sports theme for your room then you can use different sports material to make curtain rod. You can also attach balls to a wooden dowel in order to give a sporty look to your curtain rod. First of all you need to measure the length of the hockey stick. You can do this with help from tape measure. The whole stick can be used for making a curtain rod. You can even cut some part according the width of your window. Remember to cut from the handle side. Next you need to install the curtain hardware. It can be either of wood or metal depending on your choice. Remember to install it like you are installing a normal curtain rod. After installing the two pieces of wood or metal curtain hardware, you need to determine the distance between them. Use the measuring tape to calculate the distance between the two curtain hardwares. Then drill holes on the hockey stick after noting the length. If you are using curtain hardware made of wood then you can simply drill a hole in front of it. Then place the hockey stick in front of the bracket and insert the screw. This will attach the hockey stick to the bracket. In case you are using a metal curtain hardware bracket then you are encouraged to find one that has a hole in front. By this you can simply insert the screw into the bracket and close it with a nut from the backside. If you are using a metal bracket which has no hole then you can attach your hockey stick with help from epoxy. Then wrap twine around it in order to hold the hockey stick in the place. Remember to make an x shape when wrapping the string around the stick.